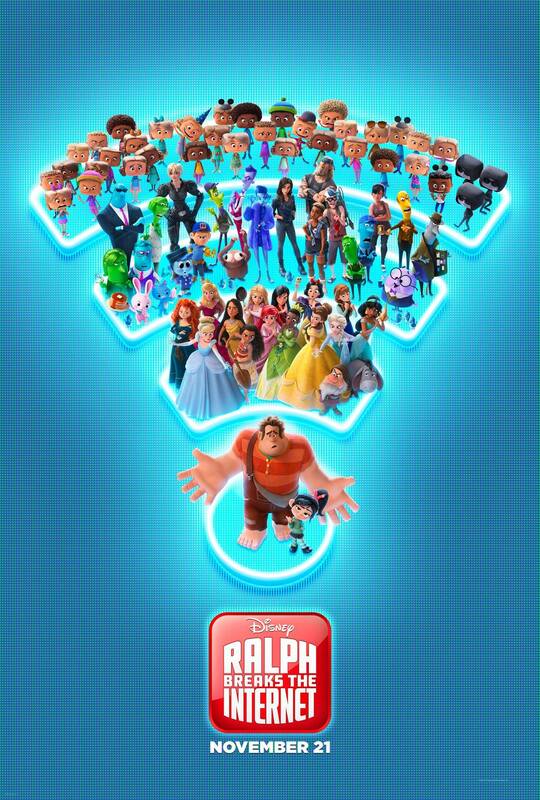 Video game buddies Wreck-It Ralph and Vanellope Von Schweetz venture into the big city of the internet in Walt Disney Animation Studios‘ new animated comedy adventure Ralph Breaks the Internet. A sequel to Disney Animation’s 2012 animated feature Wreck-It Ralph, the film picks up six years after the original. Ralph (again voiced by John C. Reilly) and his BFF Vanellope (again voiced by Sarah Silverman), who are both still active players in their respective video games (Fix-It Felix, Jr. for Ralph and Sugar Rush for Vanellope), are in a pretty set routine in Litwak’s Arcade. Every night after the arcade closes, the two of them meet up for a root beer at Tapper’s and then go hang out in some of their other favorite games in the arcade (including a 1980s Tron video game!). While Ralph feels perfectly content with the way life is, Vanellope is wondering about if there might be something more to her existence than racing on the same tracks in her game every day. When Ralph tries to help Vanellope feel better, he instead causes a major problem with the Sugar Rush game, leading to the breaking of the console’s steering wheel (he is Wreck-It Ralph, after all) and prompting Mr. Litwak to unplug the game. With all the citizens of Sugar Rush now homeless, the other characters of the arcade that we met in the first film, including Fix-It Felix, Jr. (again voiced by Jack McBrayer) and Sgt. Calhoun (again voiced by Jane Lynch), come to the aid of their fellow video game neighbors. 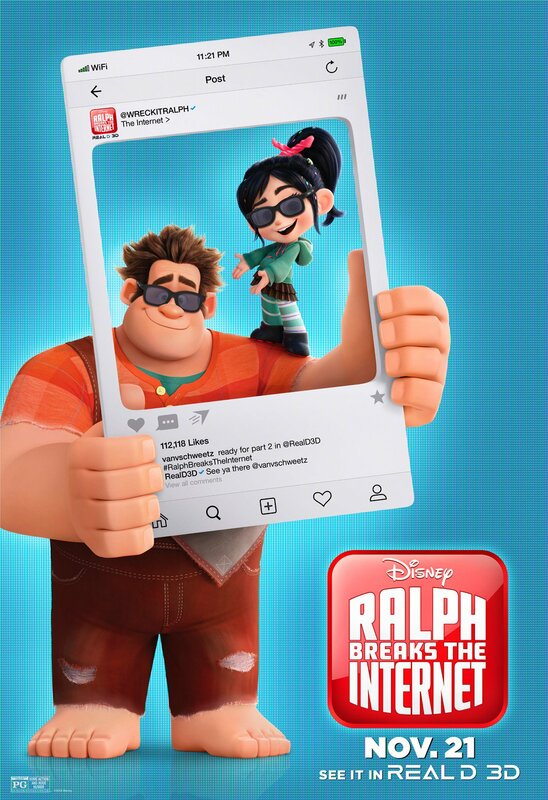 Ralph and Vanellope then decide that they will try to get the required part to fix Sugar Rush and to restore things back to how they were in the arcade by traveling to the internet via the arcade’s newly installed internet connection. Here’s the latest trailer that shows the film’s setup. What follows is a classic small town kids traveling to the big city sort of story, just amped up a bit by turning many of the familiar websites we know and love (Google, eBay, Amazon, etc.) into places within the giant electric “city” of the internet. Ralph and Vanellope get in way over their heads, Ralph continues to, well, wreck stuff, and the two have a grand adventure of experiencing new things and figuring out what they want out of life. New characters introduced in the film include the stylish tastemaker algorithm Yesss (voiced by Taraji P. Henson), tough-as-nails race car driver Shank (voiced by Gal Gadot), know-it-all Knowsmore (voiced by Alan Tudyk), and dark net gangster Double Dan (voiced by Alfred Molina). And in one of the funniest segments of the film, all of the Disney (and Pixar!) princesses are in the same scene at the same time and are voiced by all of the living actresses who voiced them in the original films: Ariel (Jodi Benson) from The Little Mermaid, Belle (Paige O’Hara) from Beauty and the Beast, Jasmine (Linda Larkin) from Aladdin, Pocahontas (Irene Bedard), Mulan (Ming-Na Wen), Tiana (Anika Noni Rose) from The Princess and the Frog, Rapunzel (Mandy Moore) from Tangled, Anna (Kristen Bell) and Elsa (Idina Menzel) from Frozen, and Moana (Auli’i Cravalho) along with the OG Disney princesses Snow White, Cinderella, and Princess Aurora from Sleeping Beauty. Oh, and Merida (Kelly Macdonald) from Pixar’s Brave is there, too. Also making cameo or brief appearances in the film are some popular real-life YouTubers and internet celebrities, including Colleen Ballinger (aka Miranda Sings), Dani Fernandez, GloZell Green, Tiffany Herrera (aka Cupquake), and Flula Borg. Director Rich Moore is back for the sequel. This time he is joined by co-director Phil Johnston, who also co-wrote the screenplays for this film as well as the original Wreck-It Ralph. The film is loaded with their trademark and witty humor, which I love. I admire so much how they are able to make situations and things funny without being cynical and without just dumping in jokes for the jokes’ sake. Rather, the humor, while extremely topical, always helps to propel the story and character development and it never feels out of place. This is not only a great sequel, but an endlessly clever and entertaining film. With its compelling story, interesting characters, amazing visuals, and witty interpretations of how the internet might work if it were an actual place, huge kudos are due to all of the artists at Disney for creating something so beautiful to look at and so fun to experience. Taking this journey to the big city with Ralph and Vanellope is a total joy from beginning to end (and make sure to stay through the end credits, too). Ralph Breaks the Internet is rated PG by the Motion Picture Association of America for “some action and rude humor.” It opens in theaters on November 21. As an added bonus, here’s the poster for the exclusive Real D 3D screenings of the film. And here’s the official one-sheet for the film.